Do your rugs need rebinding or reweaving? Do they have holes and worn fringes? Schedule an Texas City Rug Repair by KIWI Services to help restore your rugs to their most beautiful. The Texas City Rug Repair experts at KIWI carry your rug through an extensive repair process. Our specialists know everything that’s necessary to restore your fine rugs. Whether you have Berber rugs or fine imported Oriental rugs, we treat them all like precious treasures. 2. 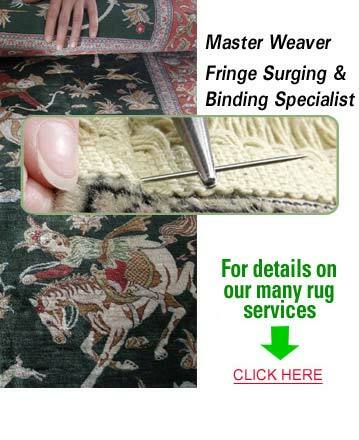 A Master weaver for full restorations of all types of rugs. There are over 64,000 varieties in weave patterns in fine rugs, which can become complex and detailed in their patterns. The Texas City Rug weaving specialists can distinguish between each type and weave and can restore your rug to look like new! Even with tears and holes, we can restore your fine oriental rugs to their original splendor. KIWI offers repairs for oriental rugs and Persian rugs. We also repair other types of rugs, including: Chinese, Pakistani, Indian, Egyptian, Olefin, Area rugs, Dhurry, and Berber. Keep your rug looking great with the best rug weaving and repairing services in Texas City, Texas. Call Kiwi!